First of all, I believe that you should never grow up. Never. Be a kid at heart, always. Age is just a reference point and should not characterize who you are. Sure it identifies how long ago you were born, but not your level of maturity, your accomplishments, or your potential. That being said, it’s funny to see how one has changed over time. Many times, the first question you are asked as a kid is, “What do you want to be when you grow up?” I’m sure I’ve had some pretty crazy answers, some that stretched my mind and some that were just meant to make my parents mad. Omitting some (astronaut, inventor, game show host, chef) here are some of my job desires as they have changed over time. You’ll see doctor was in late high school and early college, then disappeared quickly. Fireman has lingered since the local fire captain (Mr. Fioretti) had me demo stop, drop, & roll in kindergarten. 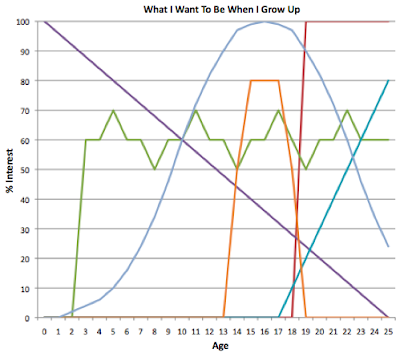 Athlete took a natural parabolic trip through adolescence and tailed into my twenties. Ruler of the world was on an obvious decline since conception as more and more barriers to that role popped up. Professor has been on a steady incline, as is being an educator of any kind. And with that, being an adsideologist skyrocketed early in college as I truly hope I can spend the rest of my life helping others learn and gain a comfortable understanding of life and the world. It’s also interesting to find the ages at which the most paths changed, and where the paths changed the most. College was obviously a pretty turbulent time regarding aspirations, as it probably was for most who have gone through it. Steep slopes and frequent intersections of these aspiration pathways. A great thing perhaps, as the times of greatest change can be the most valuable learning experience. So how about you? What do your aspiration pathways look like?